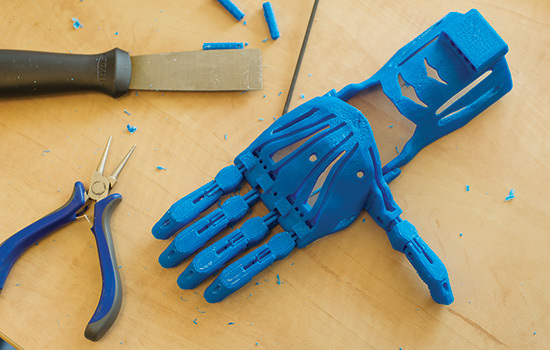 The completed 3D-printed components of a hand. Parts include the fingers, phalanges, palm, tensioners and the gauntlet, which helps to stabilize and attach to the wrist. Later, string and elastic will be added to bring the hand to life. Lucas LeMay had three wishes for his 10th birthday. He wanted to grip a full hand of cards when he plays Uno with his family. He wanted to press the brakes on his bike. But most importantly the fifth grader wanted to hold a taco. As he nervously walked into a lab at RIT, standing firmly between his parents, he spotted his birthday gift resting on the table. It was his favorite color—blue, just as he asked for. It was even his size. In fact, it was custom made for him. Lucas, who was born without fingers on his right hand, went home that day with the gift of a new 3D-printed mechanical hand. Using 3D printers, open source designs and a little bit of ingenuity, a group of students and a research scientist at RIT are helping to advance the quality of prosthetic devices and make them available to everyone. In the past four years, the emergence of affordable 3D printers and the do-it-yourself Maker movement have sparked a revolution in prosthetic devices. Just as a painter uses layers of paint and specific brush strokes to create art, a 3D printer uses specific digital instructions to lay down layer upon layer of plastic to create a finger or palm. The customized parts are then assembled using string, bolts and nuts from an everyday hardware store. The total cost is less than $50, nowhere near the tens of thousands of dollars people pay for traditional prosthetic devices. “This is an inexpensive process that can be completed by almost anyone, especially now that many schools and libraries have 3D printers for people to use,” said Jon Schull, a research scientist in RIT’s Center for Media, Arts, Games, Interaction and Creativity (MAGIC). 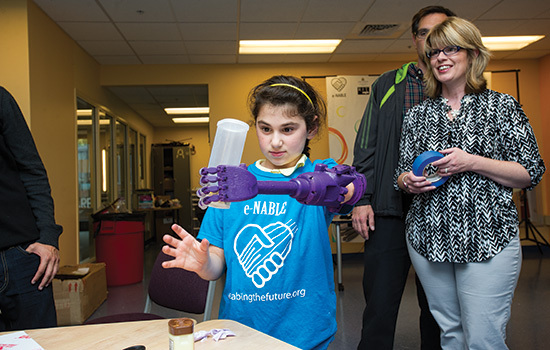 In 2013, Schull created the online community e-NABLE, a group that aims to advance the development of these affordable devices and connect 3D-printing hobbyists and professionals with people in need of prostheses. Today, the popularity of e-NABLE has exploded with more than 2,000 volunteers helping at least 100 people around the world. At RIT, a dozen students have joined Schull for cooperative education experience and as volunteers. Using their design and biomedical engineering skills, they hope in the future to take these assistive devices beyond children with birth abnormalities to help people who have lost limbs due to war and violence, natural disasters or disease. In May, RIT students developed a prototype and design for e-NABLE’s first 3D-printed mechanical forearm, which they donated to two recipients in Buffalo. The students and Schull are working to create exoskeleton devices and arms that use motors to augment or replace muscles. They also are collaborating with a Johns Hopkins University research lab to create a shoulder-powered harness. Born in Shanxi, China, a mining area about 300 miles southwest of Beijing, Lucas would wake up every morning to streets covered with inches of coal dust. He was living in a province that saw a rate of birth defects six times higher than the national average. But in 2008, everything changed. Jim and Kim LeMay traveled to the city in search of a son. They fell in love with the shy but clever 4-year-old boy and decided to adopt him. Lucas was still adjusting to life with a big sister, Lindy, and his dog, Chance, in Walworth, N.Y., when the first 3D-printed hand was created in 2011. As the story of that first hand goes, after a South African carpenter named Richard Van As sawed off most of his fingers in an accident, he became determined to get back to work. Because he couldn’t afford a prosthetic device, he turned to the Internet to learn how to make one. He connected with Ivan Owen, an American prop maker who had created a mechanical puppet hand, and together the pair from halfway around the world designed and produced a working hand for the carpenter. By flexing his wrist, Van As was able to control the fingers, which were attached to cable “tendons” that would tighten and relax the hand’s grip. They also created a hand for a 5-year-old in South Africa, who like Lucas was born without fingers on his right hand due to a congenital condition called Amniotic Band Syndrome. ABS is the result of fibrous bands that wrap around a hand or a foot in utero and cut off circulation. About one in 1,200 children born every year has underdeveloped fingers and limbs as a result of the condition. Although the first hand was designed with aluminum, Owen decided that using plastic parts created by a 3D printer would save time and money. Calling it the Robohand, they posted the design and an instructional how–to video online for anyone to use. Schull first became interested in prosthetic devices at a National Collegiate Inventors and Innovators Alliance conference in 2012, where he learned of several engineering classes that helped design a custom prosthetic hand for someone in need. Impressed by their work, the entrepreneur and then associate professor in RIT’s interactive games and media program began to think about ways to combine his passions for innovation, collaborative technologies and invention. He knew that 3D printers and open source software could be used to collaboratively improve the design process and bring the technology to the masses. After a year of trying to build interest by bringing together a multi-university consortium that would design and donate prostheses, he began to fear that his idea was too grandiose. Looking for inspiration, he went back to the video of the South African carpenter. Within six weeks, the Google community had 70 volunteers and e-NABLE had been created. For the LeMays, there was never an urgency to purchase a commercial prosthetic hand. Lucas had visited a doctor when he first came to the United States, but it would have cost $42,000. And he didn’t need one. However, when a friend posted a link to e-NABLE on Kim LeMay’s Facebook wall in May, she was intrigued. As Lucas got older, he did encounter a few activities where more grip would be useful. A second hand could put more power behind his baseball swing and steady his basketball shot. At this point, the e-NABLE community had grown to almost 1,000 members worldwide, and Schull and RIT students were playing a crucial role in its success. When Lucas visited RIT for the first time in June, the local group had already created two arms and three hands. As the family walked into the cluttered campus workshop filled with tools, machines and brightly colored spools of plastic string, Lucas saw a girl about his age sitting with her forearm submerged in a bucket of goop. Lusie, who was adopted as a baby from Armenia, was born without most of her forearm also due to Amniotic Band Syndrome. A family friend who is an RIT staff member introduced the Santangelo family to Schull. Like Lucas, Lusie had reached an age where a prosthetic arm would help her be more active, said her mother, Kathy Santangelo. 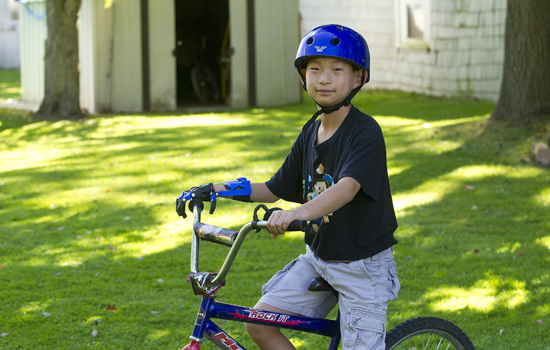 Lusie wanted to swing on the monkey bars at recess and ride a bike down her driveway. The RIT students explained that Lusie was having a plaster mold made of her left arm, which only grew to a few inches past her elbow. Using a digital scanner, the exact mold would be modeled on the computer and then 3D printed into a custom forearm cup that would comfortably hold her new arm in place. For Myers, designing and building Lucas’s new hand was a natural fit, even though it was the first 3D-printed hand she had ever built. Having always had an interest in prosthetic devices, she came to RIT with plans to tailor her major toward prosthetic design, robotics and cybernetics. While building Lucas’s hand, Myers encountered a few complications. They learned that they needed to make the shell level thicker because the plastic was splitting. “There is certainly a learning curve for building these devices, and there are always more improvements to make on your design,” she said. It has also been a learning process for Farrukh Mohiuddin, a third-year biomedical engineering major originally from Pakistan, and Jascha Wilcox, a fifth-year biomedical engineering major from Ann Arbor, Mich. They have both worked to design some of the first 3D-printed transradial arms as part of their co-ops. While much of the design is printed similar to the hand, it also incorporates PVC pipe and a rotation mechanism for the forearm, which makes it possible to emulate wrist rotation. Wilcox’s initial design, which they dubbed the “RIT Arm,” was created for 6-year-old Derek Black and 40-year-old Nathan Ramsey, both of whom are from Buffalo. In fact, Derek even opted for an extra-long arm so he could easily reach things that are far away. Mohiuddin used part of Wilcox’s design for Lusie’s arm but added his own ideas, experimenting with a silicon mold and a lighter-weight design. “We had Lusie try on several different forearm cups, and she found that our silicon version was the most comfortable,” he said. In addition to a hand for Lucas and an arm for Lusie, Elizabeth Jackson, a third-year mechanical engineering student from Ligonier, Pa., has been helping to create a 3D-printed exoskeleton. The device is for a local child with limited mobility on half of his body due to brain surgery for life-threatening seizures. Using a 3D-printed exoskeleton that goes over his arm and shoulder, the device can actuate his movements allowing him more usability with his hand. Schull envisions e-NABLE growing in both numbers and impact in the future. That teamwork was put on display at the Prosthetists Meet 3D Printers conference in late September at Johns Hopkins Hospital. In addition to bringing together medical professionals and industry leaders to discuss the future of e-NABLE, the conference served as an opportunity to provide hands-on workshops for prosthetists, children and their parents to build their own hands. The Santangelo family attended the event to meet other families and to learn more about 3D-printing technology. Kathy Santangelo hopes to have the RIT students do a presentation at Lusie’s school to explain what went in to making the hand and to show kids how cool science can be. RIT’s e-NABLE team also plans to do a presentation at school with Lucas, who has been using his 3D-printed hand to ride his bike down hills more aggressively and, of course, to eat tacos. The family ended up eating tacos his first three nights with the hand. Lucas held the taco in his right hand while pouring sauce on it with his left. He is still working on holding cards, but with help from Myers, the family will continue to adjust the grip to make the hand more functional. His parents expect him to begin using the 3D hand more at school and in public. Lucas told them that he was nervous at first getting the hand because he would stand out. To learn more about e-NABLE, go to http://enablingthefuture.org.